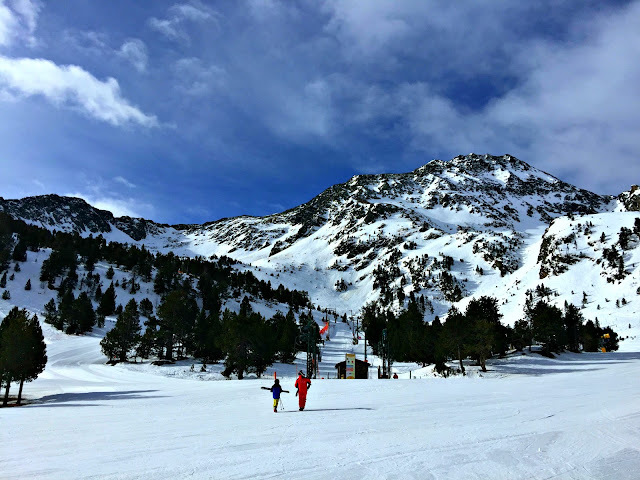 ... from the snowy mountains of Andorra. We're celebrating Easter with a helping of the white stuff. 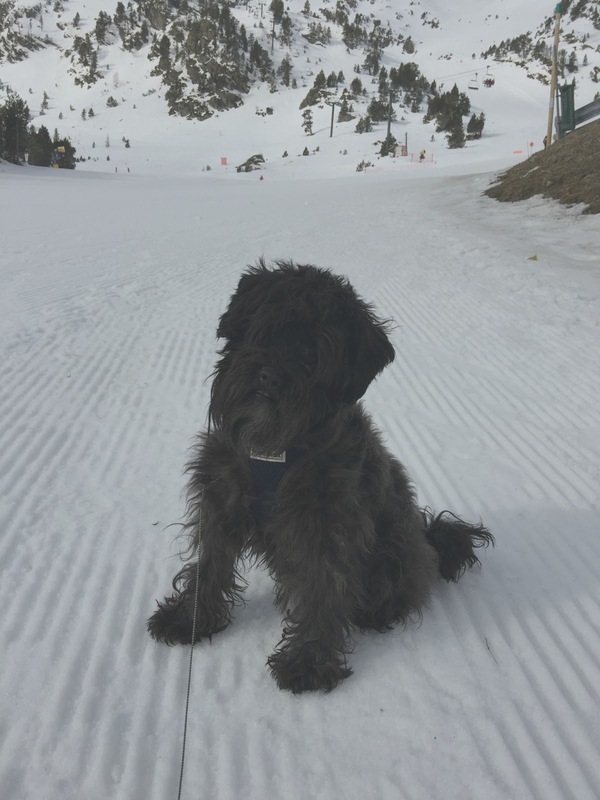 We've been spending our days skiing, and then coming back into town for the most amazing spa-pampering and fabulous food. And, of course, after all the calories we burn off up the mountain we can really tuck in and enjoy ourselves. 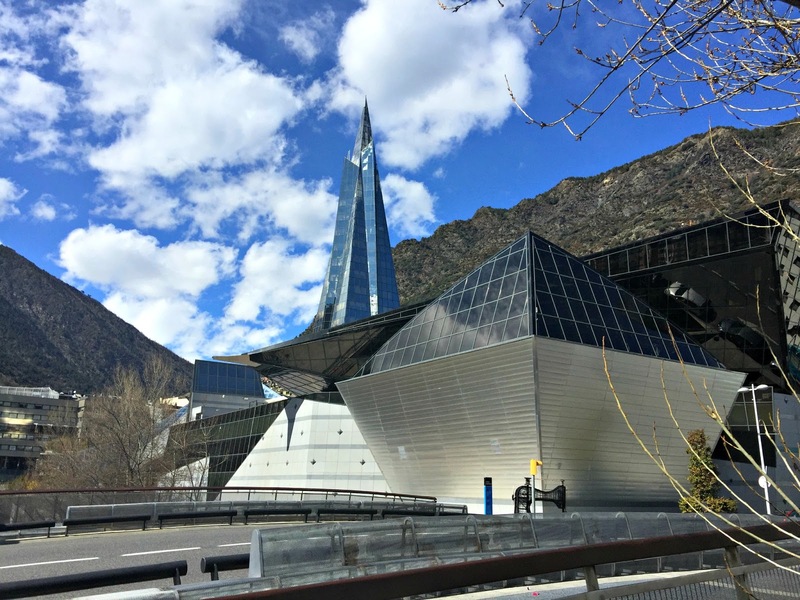 Here in Andorra La Vella they have the most incredible spa that I have ever visited. It's called the Caldea, and it's huge: the biggest in Europe. 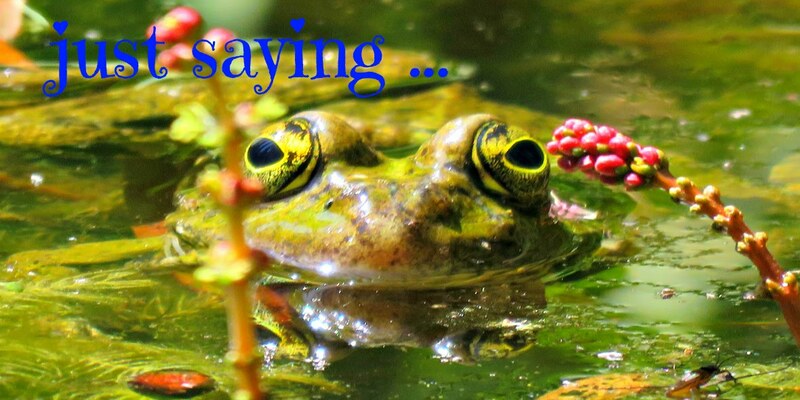 The water comes from natural thermal springs and is rich in every sort of mineral you need for fabulous skin and the relief of all manner of rheumatoid/ arthritic conditions. It's a great place for the whole family to hang out after a serious day's piste bashing. Emi loves splashing around in the outdoor laguna with the splendid backdrop of those majestic Andorran mountains. At night it's an amazing experience to just lie back in the hot water and gaze up at the stars and the black silhouette of the mountains. They make you feel very small and insignificant in the grand order of things. The spa is divided into two parts. There's a general section, and there's an adult-only section called Inuu, where they offer a range of treatments and therapies. I had a superb après-ski massage, which was just the ticket for all those muscles that hadn't had a workout since the last time I went skiing. If you plan on going I'd advise you to book into Inuu, which gives you access to the entire complex, including the general part of the Caldea. Over the Easter holidays the place was busier than I've ever seen it. And on those busy, busy days it's a good plan to have access to the less congested Inuu section, which has its own selection of wall-to-wall pools and jacuzzis, and outdoor pools and saunas and steam rooms. If you don't like your spa experience to be packed with too many other people, you may prefer being there rather than in the general section. When we were in the steam room on Easter Saturday one Spanish lady got very upset because everyone else was chatting. She loudly remonstrated with the twenty or so other people who were in there, laughing and joking and having a party, but her words got lost in the steam and no one paid her the slightest attention. She left, slamming the door behind her. I hope she had access to the grown-up zone, although, even there, she may not have found the total quiet that she seemed to be after. As I know well, given the family that I've married into: the Spanish aren't the quietest of folk! 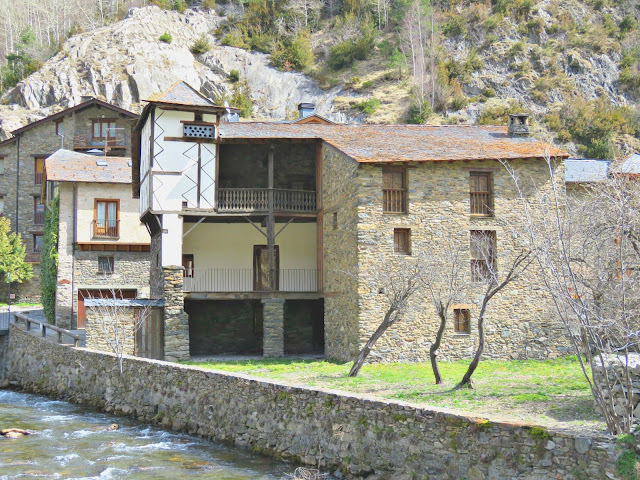 Traditionally Spanish people have come to Andorra to take advantage of the duty-free shopping. These days friends tell me that there's not a huge price difference between the shops in the Principality and those in either neighbouring France or Spain. 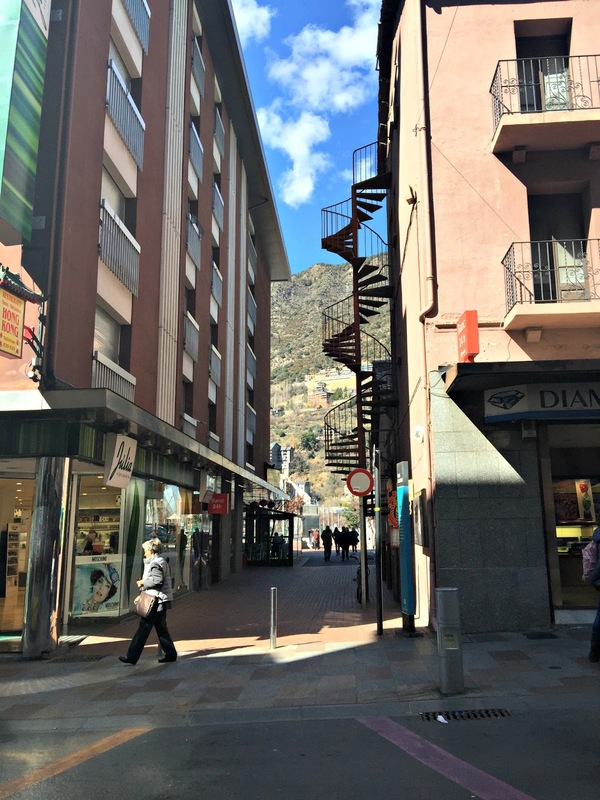 But old habits die hard, and the streets of Andorra La Vella are still heaving with beautiful shops and enthusiastic shoppers. I, on the other hand, am a very unenthusiastic shopper. The last thing you'll ever find me volunteering for on my holidays is a shopping trip, so I can't speak from personal experience about how good or bad the shops are. 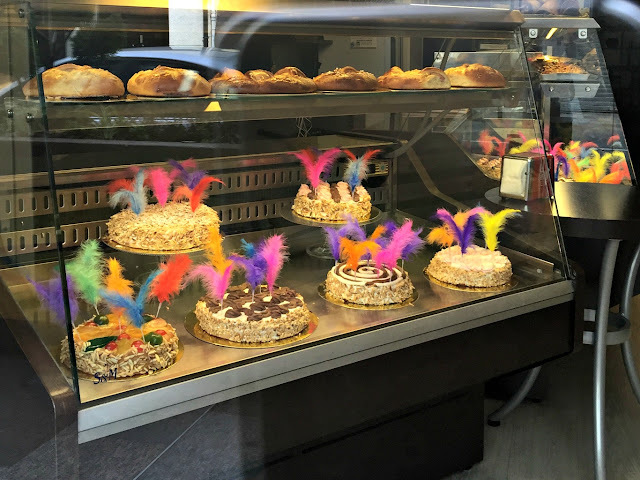 That said the WonderDog and I did trot down the main shopping street a few times when we were taking our walks, and I was very taken with the lovely Easter cakes, Monas de Pascua, all lined up for sale. It's traditional for godparents to give these cakes to their godchildren on Easter Sunday. 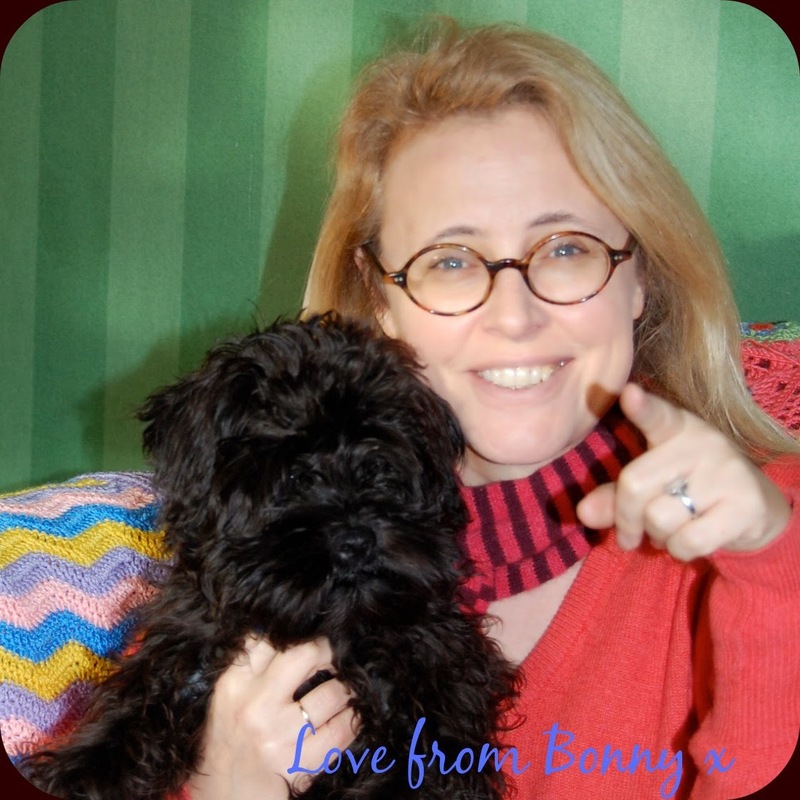 Emi has taken to carrying Monkey, his all-time favourite cuddly toy with him on his travels. One of his things at the moment is to take photos of Monkey in the various locations that we travel to. 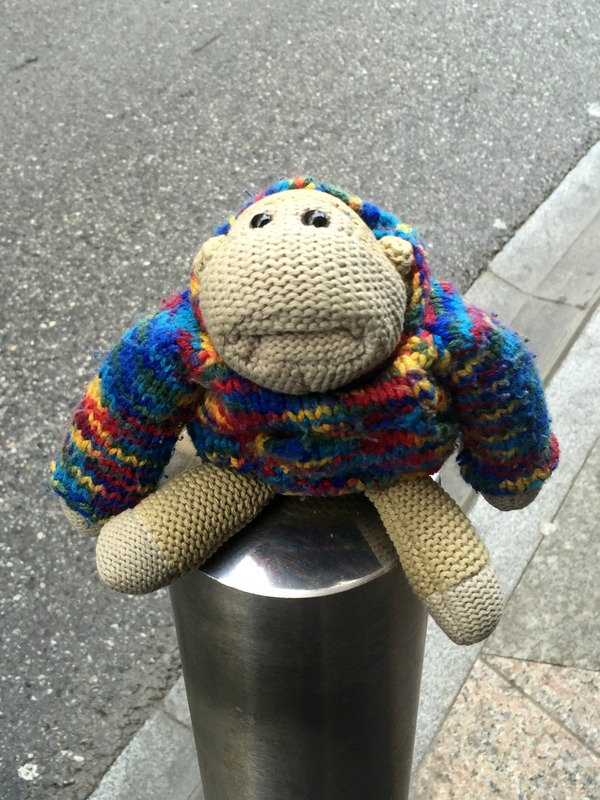 Here's Monkey sitting on a bollard (and rocking his new jumper - ahem!) in one of the side streets of Andorra La Vella. It's a bit random, but I'll go with (just about) anything that keeps the young man happy. And here's another random photo of the WonderDog posing as a Snow Dog. He badly needs a haircut, but I'd decided to leave him with lots of fur intact for the trip up to the mountains. It just didn't seem fair to strip him of his furry pyjamas when he needed them most. 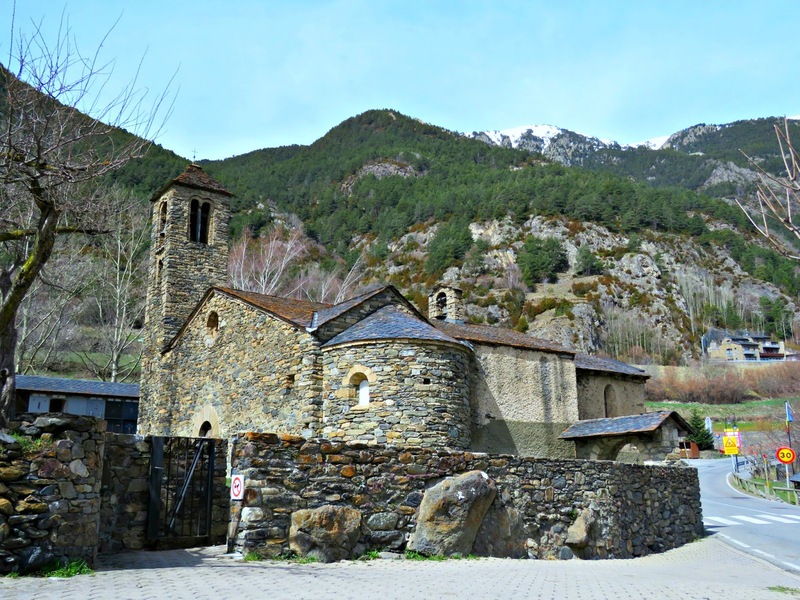 The traditional architecture here in Andorra is wonderful: lots of stone built chalet-type houses called bordas and charming little Romanesque churches. 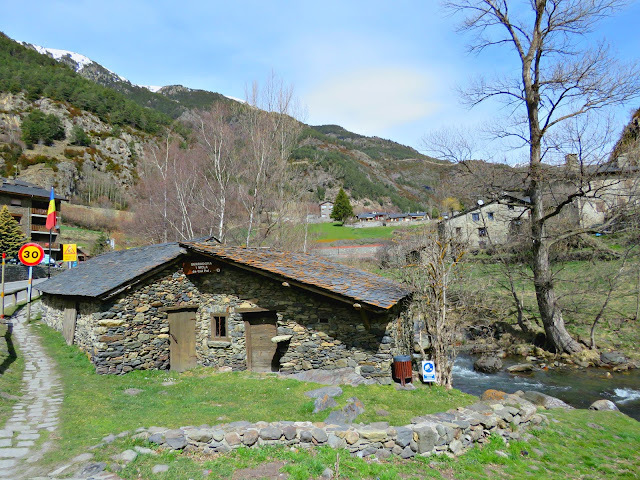 We stayed at a dog-friendly hotel in the centre of Andorra La Vella, and drove up to the snowfields every morning. En route to Vall Nord we passed this sweet little church. 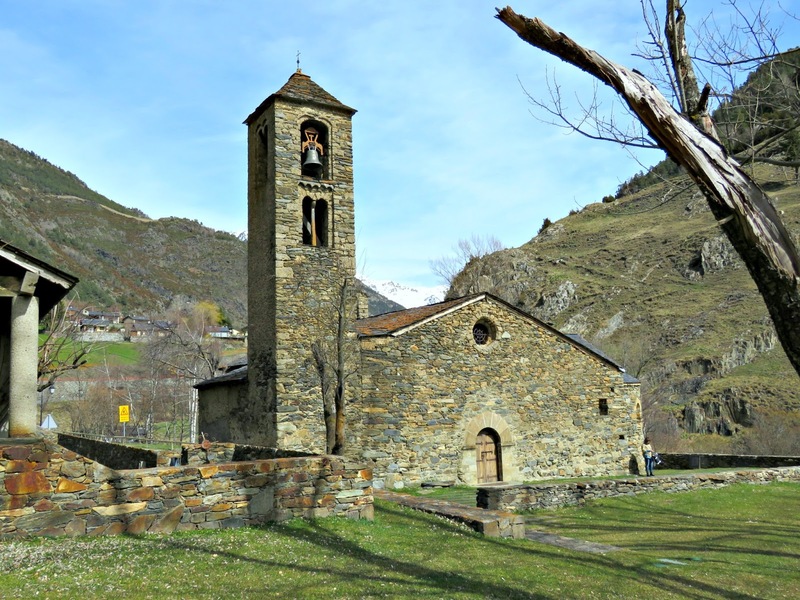 This is Sant Martí de la Cortinada. 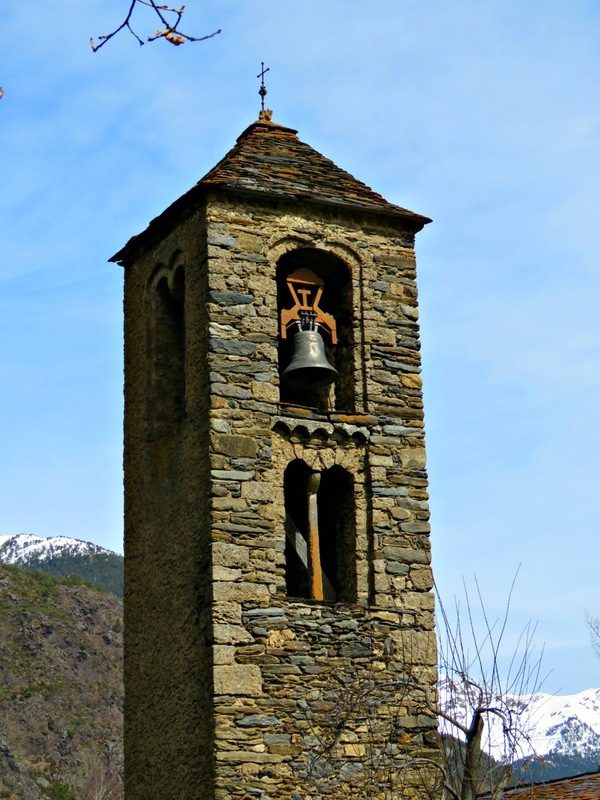 I've been admiring it for years, and finally persuaded Emi and Mr B to stop on our way down the mountain one afternoon. It's a charming little spot with a real sense of peace and tranquility. A mountain stream runs past on the other side of the road, and cows with cow bells moo and do their thing in the neighbouring pastures. 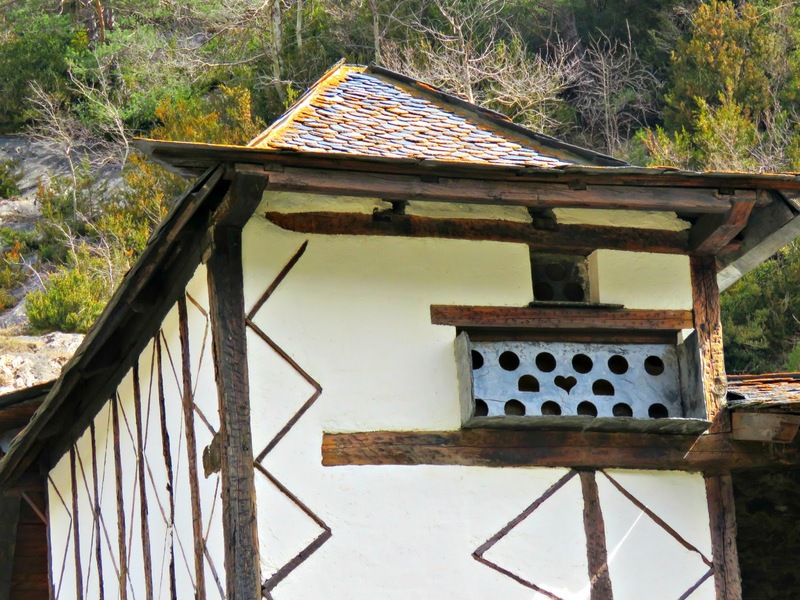 It dates from the twelfth century, with later 16th and 17th Century additions. Inside there are some late twelfth century frescoes, but sadly it was closed when I stopped by so I didn't get to see them. Across the road from the church this beautiful old borda clung to the side of a mountain stream. And further down the road I stopped to admire another fabulous borda. 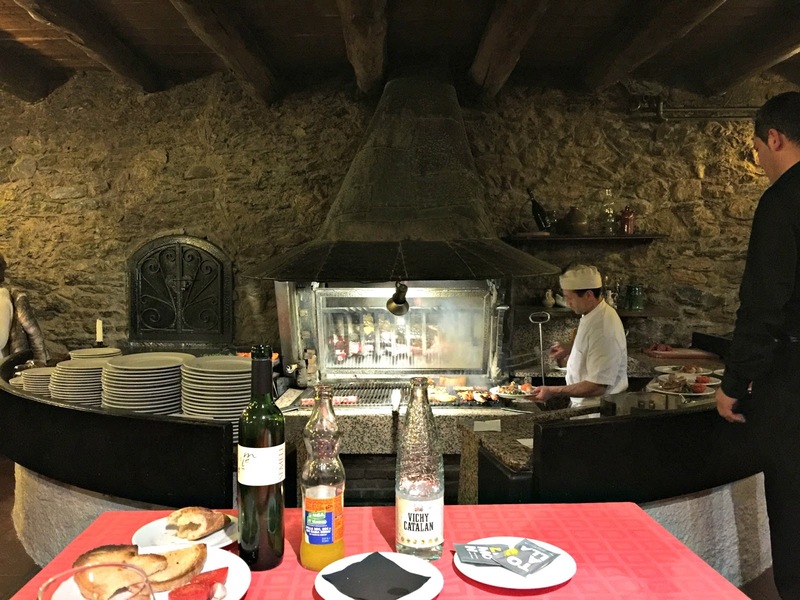 And here's our Easter Sunday dinner being cooked inside one of those bordas, the very special Borda de l'Avi restaurant in La Massana. The lovely waiters gave us the best table in the house, directly in front of the fireplace on which they cooked a la brasa prime cuts of lamb, beef and chicken over a wood fire. The verdict was a big thumbs up from our entire family, including the WonderDog who had a lamb dinner of left-overs afterwards. Anyway, that's all I've got time for. I've got a hungry family clamouring for their supper. Well I must say you had a fabulous Easter Sunday. Those are some gorgeous mountains. I loved reading about your day and seeing the sights you saw. I did not realize I was so far behind...I suppose I am on a lot of blogs. Anyway, it sounds like you had a wonderful time. That Sant Martí de la Cortinada is a beautiful place. And I loved seeing the other places, too. I would not have know what the dovecote was if you had not told me.